Ursus arctos alascensis, also known as the Alaskan Grizzly was identified as a brown bear subspecies by C. Hart Merrium in 1896. 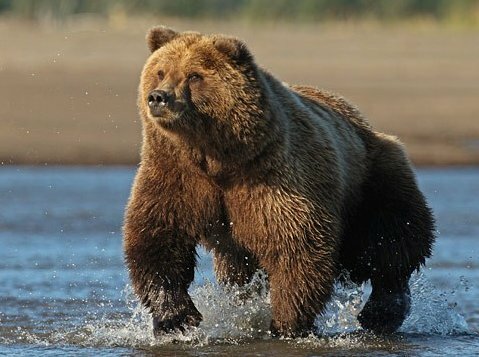 Alaskan Grizzly Bears may be found in the southern half of Alaska, in the Norton Sound region, (Unalaldik and Shaktolik Hills) southerly over the Nushagak and Kuskokwim Rivers to Chinitna on Cook Inlet. The Alaskan Grizzly is usually a dark brown, but its color can vary from blonde to black. They have a slightly concave face and a distinctive hump between their shoulders, often of a grizzled or light color. Their front claws are noticeably long. There is a large variation in the sizes of these bears, depending upon their food supply. Bears from the interior are around two-thirds the size of the coastal and island bears. Adult boars weigh from 300 to 900 pounds. Adult sows are 200 to 450 pounds. Adults are usually between 3 and 4 feet at the shoulders. 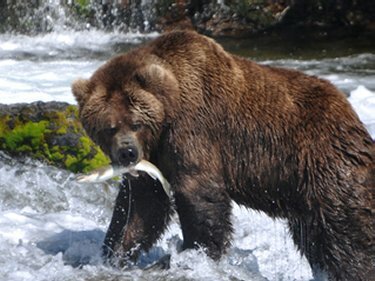 After hibernation, Alaskan Grizzlys feed on vegetation and on animals that died the past winter. They eat plants, grasses, sedges, roots, tubers, seeds, berries, salmon, and small mammals. They will also prey on moose and caribou. The bears may feed in large groups when food is plentiful. Alaskan bears usually hibernate from October or November until April or May, though sows may not emerge with her offspring until late June. Pregnant sows will give birth in the den to 1 to 4 cubs in either January or February. The cubs will remain with their mother for up to 2 years. About 25 percent of adult males remain active throughout the winter without hibernating at all. The bears' average lifespan is from 20 to 30 years in the wild. The oldest Alaskan bears on record were a 38 year old male and a 39 year old female. Hunting is permitted, but strictly regulated. Alaska Fish and Game only issues 325 hunting permits annually out of about 5,000 Alaskan natives that apply. All non-residents are required to be accompanied by a professional guide. Non-residential hunting licenses are $10,000 to $15,000. As a result, only about 160 bears are killed annually. The bear population in Alaska is considered stable.